WHEN DOES PERMISSIVE USE END? - The Rough Notes Company Inc. WHEN DOES PERMISSIVE USE END? Justin was not pleased when two men arrived to repossess his Mustang. First, he told them of his objections and then he fired at them with his shotgun. Next, he jumped into the van supplied to him by his employer and pursued them as they sped away. 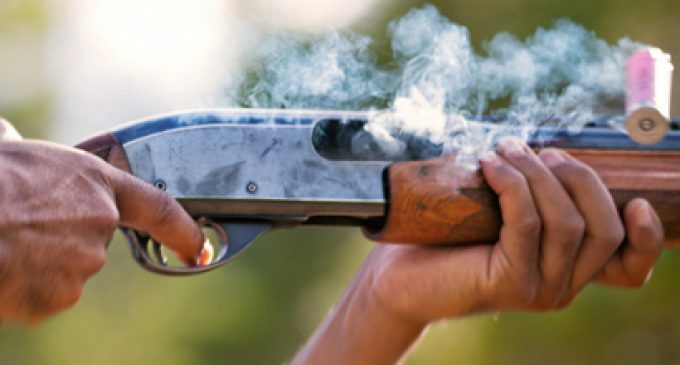 A collision occurred and the shotgun accidentally discharged killing one man and injuring the other. When plaintiffs sued Justin’s employer because the accident occurred while Justin was operating its van, the carrier refused coverage. Here is how the courts ruled. Justin Moore was employed by GTECH as a lottery machine service technician. GTECH provided him a service van that was to be used only for business-related activity and no personal use. One morning two men arrived to repossess Justin’s Mustang. He strongly objected and fired at them with his shotgun. He used his GTECH van to pursue them as they attempted to escape. Both vehicles collided and one man was killed and the other injured as the shotgun fired accidentally during the collision. Travelers Insurance, GTECH’s carrier, denied coverage when the injured man and the estate of the deceased sued GTECH. Travelers argued that Justin Moore was not an insured at the time of the loss because he did not have permission to use the vehicle in the manner in which it was used. The plaintiffs argued that the van was provided to Justin Moore by GTECH and therefore he had permission to use the vehicle as he chose. The initial court agreed with the plaintiffs and Travelers appealed. The appeals court reviewed permissive use statutes and agreed with Travelers that while GTECH did provide Justin with the vehicle and may have permitted some personal use, it did not give Justin permission to use it as a pursuit vehicle in furtherance of a crime. An important company benefit is the employer-supplied vehicle. Unfortunately, if it is the only vehicle used by a family a significant coverage gap can be created. This gap can be filled in two ways. One requires the employee attempting to purchase non-owned only coverage from a personal lines carrier. The other is for the employer to purchase CA 99 10-Drive Other Car-Broadened Coverage for Named Individuals. Below is the PF&M analysis of the ISO CA 99 10-Drive Other Car Coverage-Broadened Coverage for Named Individuals that includes a discussion on the significant gaps the employee could face without. A coverage concern exists when a family’s only available vehicle is supplied or owned by a business. Commercial auto coverage is intended for vehicles used commercially, not personally. In such cases, there’s a need to fill that gap by providing coverage equal to what is offered by a personal auto policy. There are ways to address this situation, including adding all family members to the commercial policy as named insureds. However, a simpler way is to attach CA 99 10–Drive Other Car Coverage–Broadened Coverage for Named Individuals. Individuals or families in the situation above may face several serious gaps in coverage. Liability coverage is not available when the individual or family member is operating a hired or non-owned auto. The individual is covered only while driving the company owned vehicle. Example: Marvin does not have a personal auto policy because his employer, Felix’s Shoe Factory, supplies the car he drives. A friend, Pat, stops by one day and asks Marvin to drive him home using Pat’s car. Pat is dizzy, feels nauseous, and doesn’t think he can get home safely. Marvin agrees to help out. On the way, Marvin takes his eyes off the road when Pat passes out, runs a stop sign, and collides with a minivan. Pat had only minimum limits on his policy so Marvin is left with no insurance coverage for the damages and injury he caused. 2. There is no Medical Payments or Uninsured/Underinsured Motorists coverage for the individual’s spouse or other family members. Example: Becky and her parents are permitted to drive her dad’s company-owned auto for personal use so none of them purchases a personal auto policy. Becky’s friend, Karen, invites her to ride with her to the mall. On their way back home, a pick-up strikes Karen’s car and Becky is seriously injured. The other driver was uninsured and Karen’s policy provides only minimum uninsured motorists limits. Becky’s family is responsible for the expenses that exceed Karen’s Uninsured Motorists coverage limits. There is no coverage for physical damage loss to any hired or non-owned auto. Example: Freda was test-driving Jake’s bright red convertible. She had decided it was time to become a two-car family especially because her husband’s only vehicle was a company vehicle. Jake let the insurance coverage lapse because he couldn’t afford both the vehicle and the insurance payments. While test-driving the car Freda took a sharp turn too fast, ran off the road, and struck a tree. Luckily, the airbags deployed properly but Jake’s car was demolished. Freda still had to buy the car but without financial assistance from her husband’s commercial auto coverage. CA 99 10 allows the named insured to designate the individuals who can be insured by the broadened coverage but it does not make such coverage available on a blanket basis. Anyone can be scheduled, even persons who are not employees or who do not have any relationship to the business. The coverage section indicates automatic extensions beyond the scheduled individuals. This endorsement provides six coverages but coverage applies only if entries appear in the premium space for a specific coverage and for a specific individual. Note: Underinsured Motorists coverage is automatically included if the named insured purchases uninsured motorist coverage with limits higher than basic limits. However, if underinsured motorists coverage is purchased separately, a premium and limit must be in the appropriate space on the endorsement schedule. This endorsement is flexible. It can be structured and arranged to meet various needs because coverage is scheduled for each individual. Liability coverage extends to non-owned or hired autos. Neither the individual nor any member of the household can own the vehicle. The vehicle cannot be one that the individual or spouse is working on in the course of operating a business as an auto dealer, repair operation, or parking lot. Example: Let’s revisit Marvin who hit a minivan when he ran a stop sign. Marvin would have been covered up to the limits on the endorsement schedule if CA 99 10 had been attached to his company’s business auto coverage. Coverage would have been provided for the damage and injury Marvin caused. Auto Medical Payments Coverage and Uninsured and Underinsured Motorists Coverage extends to non-owned or hired autos. This modified coverage applies to the individual scheduled and all of his or her family members. Family members include any person related to the scheduled individual by blood, marriage, or adoption, provided they reside in the same household. This includes wards and foster children. Auto medical payments, uninsured motorists, and underinsured motorists coverages apply but only scheduled for the individual. Limits must be selected. If no underinsured motorists limit is entered but the uninsured motorists limit is higher than the minimum required, the underinsured motorists limit is the same as the uninsured motorists limit. CA 99 10 provides this coverage by changing the definition of “Who Is An Insured.” The named individual and all family members who reside in the same household are insureds under the coverage form but only for coverages for which a premium charge is made and only while the individual or a family member travels in an auto not owned by the insured, by the individual listed, or by any of family member. Example: Remember Becky who was injured as a passenger while returning home from a shopping trip? Under the modified coverage, Becky has underinsured motorists coverage up to the limit on the endorsement schedule. Physical damage coverage for non-owned or hired autos is amended. This coverage extends to only the scheduled individual and his or her spouse residing in the same household. There is no coverage for other family members. It broadens the definition of covered auto to include a private passenger auto that is under the scheduled individual and spouse’s control. The auto cannot be owned by the individual or any family member and cannot be used by the individual or spouse in a business operation involving auto repair, auto sales or parking. Example: Refer to the example above involving Freda and Jake’s red convertible. While the same accident occurs during the test drive, this time, CA 99 10 is attached to the business auto coverage form. Freda’s insurance pays Jake for the damage to his vehicle and she is free to use her own money to buy the car of her dreams. Little or no additional underwriting is required if the individual who drives the business auto is the only person that gains additional coverage because the insurance company has already evaluated that individual as a driver of a company auto. However, if the individual’s spouse and/or family members are involved, their driving records should also be reviewed as part of the underwriting process. DO ANY OF YOUR CUSTOMERS HAVE THIS GAP IN COVERAGE? Many customers are not aware of the differences between personal and commercial lines coverage and may be totally unaware of this gap; the time of a serious injury accident is not the time you want to bring it up to them. The following e-marketing articles could be used to bring it to their attention so that they could call you! No coverage exists for the individual’s spouse or other family members for medical payments, uninsured motorist or underinsured motorist. Example: Cindy and her parents drive her dad’s company-owned car, so they don’t have a personal auto policy. Cindy’s pal, Karen, invites her to go shopping at a mall. Halfway there, a pick-up strikes Karen’s car and Cindy was seriously injured. The other driver was uninsured and Karen’s policy carried minimum uninsured motorists (UM) limits. Cindy’s family had to bear the expenses that weren’t handled by Karen’s UM coverage. No coverage is provided for physical damage losses to any hired or non-owned car. Example: Ginger hated the boredom and inconvenience of driving her husband’s company car, the only one in the household. Her neighbor, Jake, was selling his sports car, which he couldn’t afford to insure. Ginger liked the car, so she took it for a test drive. However, she took a sharp turn too fast, ran off the road and hit a tree, demolishing Jake’s car. She had to pay for the damages herself since the insurance on her husband’s company car did not cover the loss. Have you talked with your client about personal use of supplied vehicles? It could be a very important discussion that could reveal not only the Drive-Other-Car Coverage but also permissive auto issues. If you are unsure about the potential gap existing, consider using the following Business Building Letter to bring the issue to the forefront. “Small matters” have a way of getting pushed aside. The danger is that they sometimes grow into major problems. I’m sure you will agree that this is important enough to consider seriously. We will follow up shortly if we do not hear from you. However, if you’re as concerned as we are, please call me personally at [phone] so that we may discuss the situation. WILL “INADVERTENT OMISSIONS” COVERAGE BE THE NEXT EUROPEAN IMPORT?